The Senate all but guaranteed Samuel Alito's confirmation as the nation's 110th Supreme Court justice Monday, shutting down a last-minute attempt by liberals to block the conservative judge's nomination with a filibuster. Republican and Democratic senators on a 72-25 vote agreed to end their debate, paving the way for a Tuesday morning vote on Alito's confirmation to replace retiring moderate Justice Sandra Day O'Connor. With at least 57 votes committed to Alito — 53 Republicans and four Democrats — approval by majority vote in the 100-member Senate is now seemingly assured. 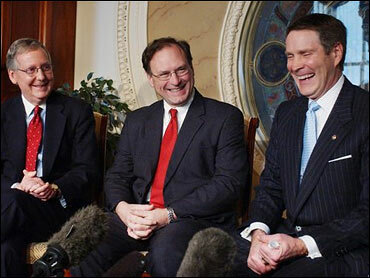 If Alito's nomination is confirmed, as expected, he likely will be sworn in within hours - so he can attend President Bush's State of the Union address Tuesday night - as the newest member of the U.S. Supreme Court. A bloc of Democrats, led by Massachusetts Sens. Edward Kennedy and John Kerry, unsuccessfully tried over the weekend and Monday to persuade other senators to use a vote-delaying filibuster to stop Alito, a 15-year veteran of the U.S. Appeals Court and a former lawyer for the Reagan administration. "It is the only way we can stop a confirmation that we feel certain will cause irreversible damage to our country," said Kerry, the Democrats' 2004 presidential nominee. If confirmed, Alito would replace O'Connor, who has been a swing vote on abortion rights, affirmative action, the death penalty and other issues. Alito's supporters needed 60 votes to block the filibuster, and they were joined by some Democrats who oppose the judge. CBS News correspondent Bob Fuss reports moderate Democrats, including some who oppose Alito, chose not to have a confrontation over filibuster that could have gotten ugly. "I find it regrettable that there are those who are trying to resurrect a filibuster even as there is clearly nothing in the record that constitutes extraordinary circumstances," said GOP Sen. Olympia Snowe of Maine, the only publicly undecided Republican on Alito's nomination. Sen. Lincoln Chafee of Rhode Island, the only Republican to announce that he will vote against Alito, also refused to support the filibuster attempt. "How are we going to get anything done if we can't work together?" Chafee asked. Other Republicans also criticized the attempt to keep Alito from getting a confirmation vote on Tuesday before President Bush's State of the Union address. "If this hyperpoliticization of this judicial confirmation process continues I fear in this moment we will institutionalize this behavior and someday we will be hard pressed not to employ political tests and tactics against the Supreme Court nominee of a Democratic president," said Senate Majority Whip Mitch McConnell, R-Ky.
"We saw no reason for the members of this group to support a filibuster," said senior Democratic Sen. Robert Byrd of West Virginia, a member of the "Gang of 14" — a group of Republicans and Democrats who have pledged not to filibuster unless there are "extraordinary circumstances." At least 53 of the Republicans' 55-member majority and four Democrats — Byrd, Tim Johnson of South Dakota, Kent Conrad of North Dakota and Ben Nelson of Nebraska — already publicly support Alito's confirmation. Chafee, independent Sen. Jim Jeffords of Vermont, and most of the rest of the Democrats are expected to vote against Alito. Alito hasn't stopped trying to gain more support. He visited with Sen. Maria Cantwell, D-Wash., on Monday before the filibuster vote in hopes of getting her vote.